Lands previously in Strathcona County and within WMU 250 have been transferred to WMU 248. This increases hunting opportunities in the area that previously fell within WMU 250. Please refer to our map below under “Rights of landowners” for the updated boundaries. The 2018 hunting season runs September 1 to December 7. Know the rules and regulations that are in place BEFORE you plan your hunt. Alberta Fish and Wildlife, Edmonton District, is responsible for wildlife management and enforcement of Alberta's Wildlife Act. The landowner is responsible to ensure that the hunter understands any conditions on which hunting is being permitted. For example, hunting may be allowed for one day, several days or longer. A hunter needs permission from the landowner or occupant to hunt on a given property. It is entirely the decision of the landowner or occupant whether to allow hunting on the property. The landowner may specify the number of hunters allowed, or particular areas they should avoid. The discharge of firearms in Strathcona County is controlled by the County's Firearm Control Bylaw 3-2014 and is enforced by the RCMP. Firearms may not be used for hunting in Sherwood Park, rural hamlets and on County property. The use of firearms is restricted within the Special Control Area. In this area, shotguns and muzzle-loading rifles, bows and arrows, and cross-bows may be used to hunt white-tailed deer and antlerless and antlered moose during this year’s Strathcona White-tailed Deer Hunt and Antlerless and Antlered Moose Special License from October 25 to December 7. Outside of the Special Control Area, Sherwood Park and rural hamlets, Strathcona County does not have bylaws restricting the use of firearms. Provincial and federal regulations apply in these areas. 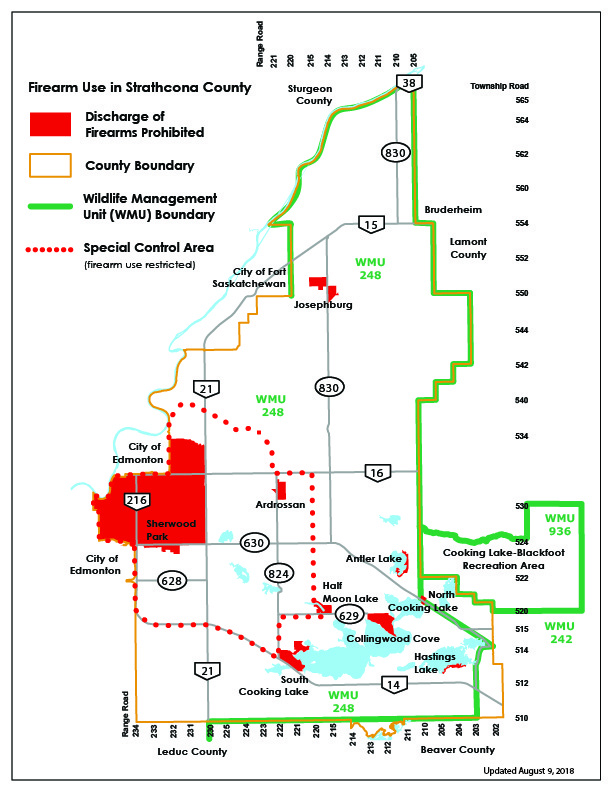 As per the 2018 regulations, the County is divided into two different Wildlife Management Units (WMU 248 and 242). Lands previously in Strathcona County and within WMU 250 have been transferred to WMU 248. Different regulations apply to each. Hunting game birds with a shotgun on road allowances is not permitted in the County. Strathcona County is a Specialized Municipality and, because of this designation, all road allowances are considered County property. There is no hunting allowed on any County property. Hunters are reminded to dispose carcasses in the correct place. The Clover Bar Landfill will no longer accept carcasses. They must be taken to the Ryley Landfill, which is equipped to handle dead animals in the proper manner. Carcasses don't belong in the green organics cart or recycle station. Too heavy – the maximum weight allowance is 90 kg (200 lb) for a cart to be able to be picked up safely. Health concerns – having a carcass out on the street poses health concerns (attracting other animals, pests). Doesn’t break down – large carcasses take significantly longer and are harder to break down in our composting process. Pieces of meat from typical household purposes (especially cooked) break down easier. Attracts animals – carcasses will attract other scavenging animals to the processing facility.